The Eco-Vat solution features a large tank (or battery of tanks) which stores rainwater collected from roof areas ready for re-use in non-potable applications, reducing the volume of surface water run-off on new developments on both green and brown field sites. 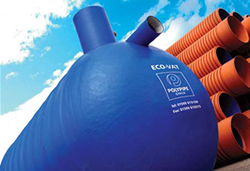 Eco-Vat tanks are available from 1500 litre to 80,000 litre capacity. Please consult our technical team who will be pleased to discuss your requirements in detail. Eco-Vat systems can be designed to incorporate stormwater attenuation as individual stand alone systems or in conjunction with other devices such as Polystorm cells and Ridgistorm attenuation tanks to drastically reduce peak discharges. Reduction in domestic mains running costs by as much as 50% with running costs typically 3p per cubic metre of water supplied. Savings on industrial and commercial developments are typically much greater than domestic applications due to increased use of water combined with larger roof catchment areas. Polypipe Civils offer full maintenance training and maintenance packages. Eco-vat systems are manufactured to precise specifications, assured by our comprehensive quality management system, Eco-Vat was the first rainwater harvesting system to be certified by the British Board of Agrement. This independent third party accreditation allows developers to gain a NHBC certificate on the product. All internal tank plumbing and electrical connections are factory fitted on a convenient lift-out service plate which may be supplied separately for a second phase of installation to reduce site damage and to spread the cash outlay. Eco-Vat components are guaranteed for two years. The system requires minimal maintenance consisting of cleaning the easily accessible filters every six to twelve months under normal conditions. It incorporates an automatic changeover to mains water when the supply of rainwater is exhausted, and an optional duty/stand-by pump set. Polypipe Civils offers on-site training for the maintenance engineer during the commissioning visit and/or appropriate maintenance packages.